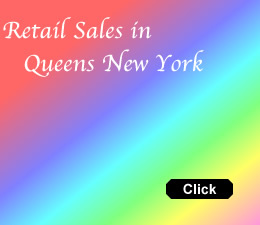 January 25, 2011 / Queens College / Queens Business / Queens Buzz. I attended the state of the borough address given by Queens Borough President Helen Marshall at the Colden Auditorium on the Queens College campus Tuesday. She structured the presentation in such a manner that it moved from issue to issue or in some cases from department to department, wherein she talked about what had happened over time periods ranging from a single year like 2010 to time periods extending back to when she took office in 2002. 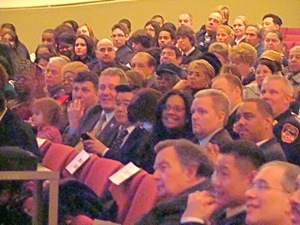 Many of Queens prominent city council members and state representatives were in attendance [see slide show at the end of this report]. There were also some former municipal government officials including Peter Vallone Sr. who was once the city council speaker and Claire Schulman who was once the Queens borough president. 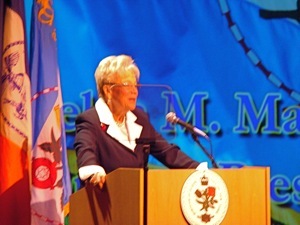 Click here to read a full report on the State Of The Borough Address 2011 by Helen Marshall. 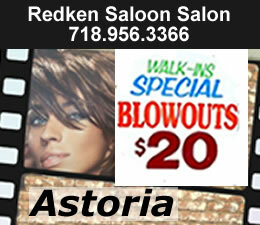 January 25, 2011 / Queens College / Queens Business / Queens Buzz. Continued - Use Search Function To Find Story Introduction. Please note that you can click on many of the photos below to go to a related story on that subject. 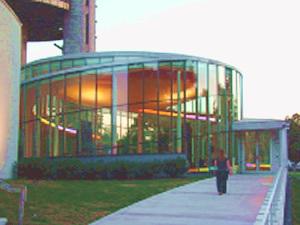 The following is a summary of Borough President Helen Marshall's State Of The Borough Address which she delivered on January 25, 2011 in the Colden Auditorium at Queens College in Flushing. Marshall noted that Queens schools are the most overcrowded schools in the city. She has asked the new schools Chancellor Black to come address the Queens School Board. She also noted she would like to see the high school graduation rate improved. She noted, as a former educator, that parental involvement is one of the key ingredients required to succeed in education. 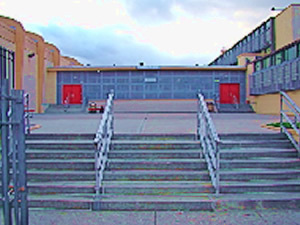 In the photo to your left is the entrance to Flushing International High School, which is located in the same building as the Daniel Carter Beard Junior High School. That said she talked about some changes that took place over the year including locating a health focused high school next to Queens Hospital to enhance the hospital / school interaction. 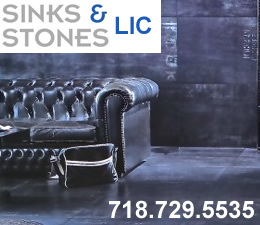 She talked about the addition of new space / seats being added to PS 280 in Jackson Heights, as well as new seats being added in Richmond Hill, Forest Hills, Maspeth and Jamaica. At the college level she talked about how enrollment in Queens Colleges is above 100,000 – a record high. She talked about how graphic design and neuroscience have been added to the Queens College curriculum. How CUNY Law School will begin operating out of LIC beginning next year. That York College has added nursing to its curriculum. And how LaGuardia Community College started a small business program, which Warren Buffet addressed at the end of the 2009 - 2010 school year. 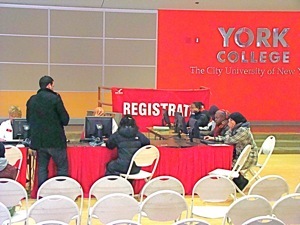 York College, during registration, is shown to the right. Queens lost four hospitals in recent years. There are currently ten hospitals serving 2.3 million residents in the county. That’s 230,000 people per hospital vs an average in the U.S. of about 52,000 people per hospital. People per hospital is not the best measure for comparison purposes, as Queens hospitals are likely to be far larger than hospitals in less densely populated areas. Queens hospitals would need to be five times larger than the national average, which is within the realm of reason. A new facility for cataract surgery and cardiology were added to a Queens Hospital but I missed the hospital name [possibly New York Hospital Queens]. The HIV center at Elmhurst Hospital in Elmhurst was renovated. More paid beds, surgery and an operating room were added to the LIJ - Cohen Children's Medical Center at Zucker Hillside Hospital in Glen Oaks on the Nassau County border. 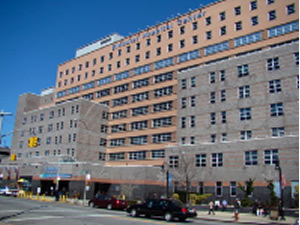 Something about the Jamaica Hospital and something about St. Mary's Hospital. 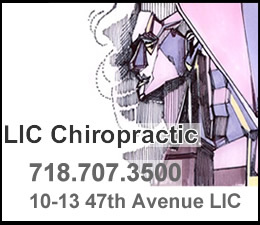 And QLIMG [Queens Long Island Medical Group] just opened a new clinic in southeastern Queens. Elmhurst Hospital is shown in the photo to your right. Marshall noted that about 30% of the Queens population are seniors. She vowed to fight against cuts for home delivery of meals and transportation services for them. She talked about how they’re trying to reduce / manage scarce resources to keep senior services operating. She gave an example of outsourcing meals in Brookville and working with an ambulance corps in in Woodhaven / Richmond Hill. Marshall noted that crime was down overall, but that there were some troubling trends. The murder rate in southeast Queens is up 28% and double the murder rate for the city as a whole. 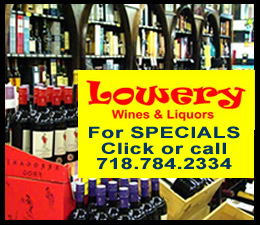 Grand larceny and auto theft were up 7% while the rate for the city as a whole was down 2%. But she noted Queens performed well in other areas and she gave thanks to Queens two Assistant Chiefs of Police, Diane Pizzuti of Queens North and James Secreto of Queens South, for their work in law enforcement. Marshall noted that about 20% of homes in Queens witness domestic violence. Marshall commended a fireman who had reached into a burning kitchen to pull a youngster out of harms way. 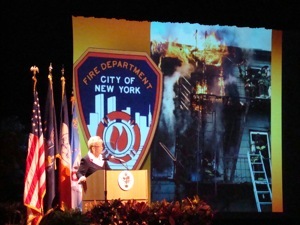 In the photo to your left is Queens Borough president Helen Marshall giving the State of the Borough address with a slide of a fire in the background. Marshall noted how they had won an award for rapid response time. Marshall noted that Queens Libraries receive $77,000 less per library than the libraries in Brooklyn. She believes that Queens Libraries were short funded by $11 million. She wants to pass a fair funding law, so that the distribution of public funds is done more equitably. 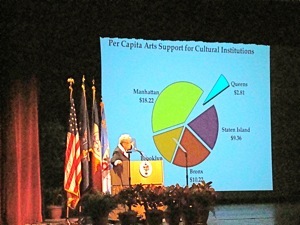 Marshall presented a chart which shows how much Queens gets of the public funding pie for the arts vs the other boroughs. It’s the smallest slice. Again this has something to do with how funds are distributed throughout the city's boroughs. In the photo to your left is a pie chart showing the sliver of funding that went to Queens emerging cultural organizations versus the pig-sized share that went to the well-endowed cultural organizations in Manhattan. The Manhattan share of the cultural pie could have purchased over five Steinway Mansions at the asking price. Marshall noted that the renovation of The Museum of Moving Image Museum in Astoria was just completed. She noted that the Queens Museum Of Art will double its space next year by closing the old ice rink. This shouldn't affect recreational time as just two years ago the World Ice Arena opened in a nearby locale in the park. She mentioned something about the NY Science Hall. The Queens Botanical Garden is LEEDS certified and they’re going to offer classes to leverage the investment that was made a number of years back. Queens Theatre In The Park just opened its new café / lobby last year. Also in Corona they’ve started working on a Louis Armstrong visitors center across the street from the original house. This is expected to be completed next year. The Jamaica Performing Arts Center was opened this year after extensive remodeling of the old Dutch Reformed Church. And there’s some renovation work being done at PS1 in Long Island City. Also in Jamaica the Afrikan Poetry Society will undergo a renovation this summer. Apparently having the JFK Airport here in the borough contributes $9.8 billion to the Queens County economy, of which $3.9 billion of that is in wages. 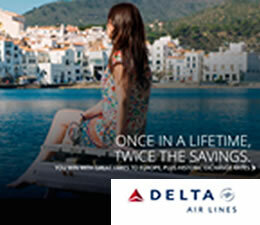 They are expanding Terminal four to accommodate a request by Delta for a terminal. The project will start this year, run three years and will cost $1.2 billion, some of which she told us should end up in Queens in the form of wages. 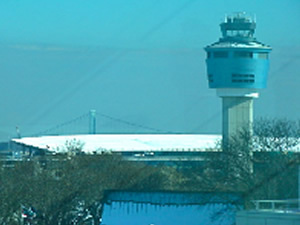 LaGuardia Airport opened its new tower in mid January 2011. This control tower replaces the control tower installed in anticipation of traffic for the 1964 World’s Fair. Marshall has been working with Tom Boscoe of LaGuardia Airport to obtain new technology to replace radar. The Throgs Neck Bridge, that connects Queens to the Bronx, turned 50 this year. Approximately 114,000 people cross the bridge every day. Many end up on the Kew Gardens interchange which will undergo renovations in 2011. A $7 million fine will be used to clean up the some of the Newton Creek waste water treatment issues. 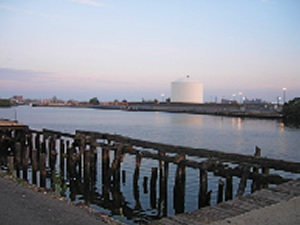 Newton Creek is located under the Kosciuszko Bridge which connects Queens and Brooklyn. Another $350 million over four years will be allocated to south and eastern Queens to fix the sewer system so that the extensive flooding they’ve repeatedly seen will abate. 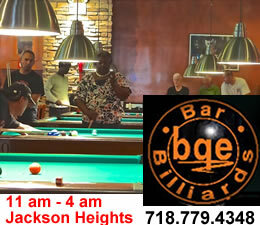 This affects College Point, the Far Rockaways and two other neighborhoods in south / eastern Queens. Marshall talked about millions of dollars going to Queens Parks over the past year. One of the projects was to fix the Unisphere Fountain in Flushing Meadows Corona Park so that it could be turned on at full power. The 1939 Boat House, where the annual dragon races occur, was also renovated. A bandshell in Floral Park was re-opened, and improvements to the cricket fields in Baisley Park and Ozone Park, and the soccer fields off College Point were made. Renovations were made to the Alley Pond Environmental Center. Indoor tennis courts [installed or renovated?] at Roy Wilkins Park. And something done at the Thomas Edison High School baseball field and track. Marshall said that some buildings were preserved in South Ridgewood, Jamaica PS66 in Jamaica and the Ridgewood Theater in Ridgewood. Funding was provided to help preserve the Bowne House, King Manor, the Lewis Latimer House, the Kingsland Homestead, the Queens County Farm, and Tiferets Israel synagogue in Corona. 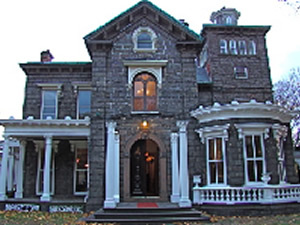 There wasn’t any mention about preserving the Steinway Mansion in Astoria [click link to view section of site containing numerous reports about the significance of the Steinway Legacy and its lasting impact on Queens and NYC - I recommend scrolling to the bottom of the section and working your way up]. 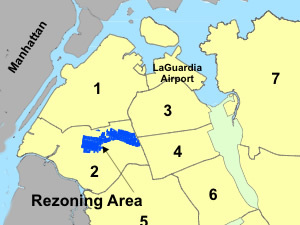 Marshall talked about the significant level of re-zoning that’s been done in Queens. Since she started in 2002 there were 40 re-zonings affecting 500 blocks at the end of 2009. By the end of 2010 [if I got this right] there were 800 blocks affected by re-zoning. She mentioned that Sunnyside and Woodside are on the drawing boards for re-zoning this year. 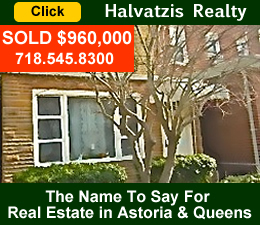 Click to the Queens Buzz Real Estate section of the site for details. The map to your left shows the area currently in the process of being re-zoned. Marshall said that southeastern Queens is the epicenter of foreclosures in NYC. She mentioned that to accommodate people losing their homes the city was erecting housing for displaced people in Astoria, Far Rockaway, Richmond Hill, Flushing, Howard Beach and another neighborhood - the name of which I didn’t catch. Marshall talked about the new casino that will be erected at Aqueduct Racetrack near Jamaica. There is [?] 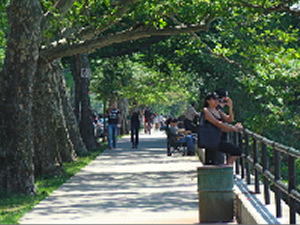 an 18 acre regional park in Far Rockaway. A Far Rockaway firehouse was converted into a YMCA. The Flushing Commons project is underway which will provide a town square, a YMCA, parking and retail space. 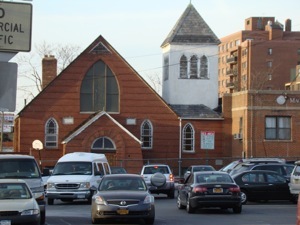 The Macedonia AME church will remain in its location adjacent to this new development. 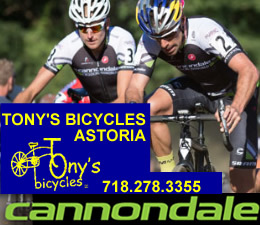 The old RKO Radio building and site is currently being evaluated for development in Flushing. There’s a multi-million dollar project underway this year at Willetts Point in Flushing next to CitiField. As part of the Willetts Point project they’re planning to re-zone the waterfront along the Long Island Sound [not sure of this exactly]. There’s a $40 million infrastructure project at Hunters Point South underway too which eventually will include some middle income housing units within the 5,000 planned for erection. She also commented on the revived area around the Queens Boro station / Queens Boro Bridge entrance as a large new building has been mostly completed and should begin operations sometime this year. Jet Blue decided to stay in Queens after evaluating a number of other locations. All of these projects are tied to construction, retail, transportation and other jobs. There are three infrastructure projects in Jamaica underway including the Atlantic Avenue extension to ease congestion, a project around the plaza [?] 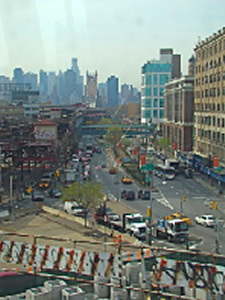 and the Sutphin Access project – also designed to ease traffic congestion. She said something about work on the Queens Family Courthouse. And work on the cemetery along Jamaica Avenue. This same night President Obama will give his State Of The Union address. As such Joseph Crowley and Carolyn Maloney were not in attendance. But many of the city council members and state assemblypersons and senators were in attendance. Marshall cited many of them for being instrumental in securing funding for some of the projects mentioned above, as well as the U.S. Congressional representatives who were absent. About 40% of all citizens in Queens County were foreign born. Hence Marshall started a Queens General Assembly to enhance community dialogue. She also commended the presidents of the fourteen community boards for the work they’ve done, along with the District Managers who I believe work with them. This year the government set up a LGBT online resource to help accommodate gay needs in the community. Lastly Marshall handed out two lifetime achievement awards to Carol Hunt and Anthony Caminiti. Hunt is the former executive director of the Jamaica Service Program for Older Adults, and Anthony Caminiti for his lifetime involvement in Community Board 4. This is what we heard at the Borough President’s State Of The Borough Address. Comments and questions are welcome below. 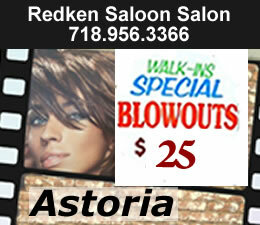 Click this link for promotions, discounts and special offers in Astoria and Queens. 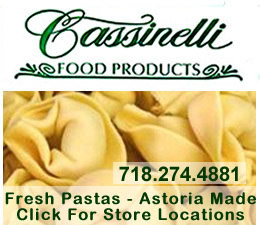 Click this link to go to the Astoria Neighborhood, click this link to go to Astoria Restaurants and click this link to go to Astoria Shopping.